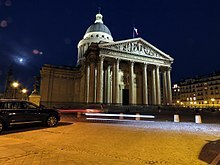 The Panthéon (Latin: pantheon, from Greek πάνθειον (ἱερόν) '(temple) to all the gods') is a building in the Latin Quarter in Paris, France. It was originally built as a church dedicated to St. Genevieve and to house the reliquary châsse containing her relics but, after many changes, now functions as a secular mausoleum containing the remains of distinguished French citizens. 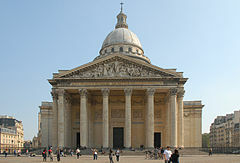 It is an early example of neo-classicism, with a façade modelled on the Pantheon in Rome, surmounted by a dome that owes some of its character to Bramante's Tempietto. Located in the 5th arrondissement on the Montagne Sainte-Geneviève, the Panthéon looks out over all of Paris. Designer Jacques-Germain Soufflot had the intention of combining the lightness and brightness of the Gothic cathedral with classical principles, but its role as a mausoleum required the great Gothic windows to be blocked. King Louis XV vowed in 1744 that if he recovered from his illness he would replace the ruined church of the Abbey of St Genevieve with an edifice worthy of the patron saint of Paris. He did recover, and entrusted Abel-François Poisson, marquis de Marigny with the fulfillment of his vow. In 1755, Marigny commissioned Jacques-Germain Soufflot to design the church, with construction beginning two years later. The foundations were laid in 1758, but due to economic problems work proceeded slowly. In 1780, Soufflot died and was replaced by his student, Jean-Baptiste Rondelet. The re-modelled Abbey of St. Genevieve was finally completed in 1790, coinciding with the early stages of the French Revolution. Upon the death of the popular French orator and statesman Honoré Gabriel Riqueti, comte de Mirabeau on 2 April 1791, the National Constituent Assembly, whose president had been Mirabeau, ordered that the building be changed from a church to a mausoleum for the interment of great Frenchmen, retaining Quatremère de Quincy to oversee the project. Mirabeau was the first person interred there, on 4 April 1791. Jean Guillaume Moitte created a pediment sculptural group The Fatherland crowning the heroic and civic virtues that was replaced upon the Bourbon Restoration with one by David d'Angers. Twice since then it has reverted to being a church, only to become again a meeting house dedicated to the great intellectuals of France. The cross of the dome, which was retained in compromise, is again visible during the current major restoration project. In 1851, physicist Léon Foucault demonstrated the rotation of the Earth by constructing a 67-metre (220 ft) Foucault pendulum beneath the central dome. The original sphere from the pendulum was temporarily displayed at the Panthéon in the 1990s (starting in 1995) during renovations at the Musée des Arts et Métiers. The original pendulum was later returned to the Musée des Arts et Métiers, and a copy is now displayed at the Panthéon. It has been listed since 1920 as a monument historique by the French Ministry of Culture. From 1906 to 1922 the Panthéon was the site of Auguste Rodin's famous sculpture The Thinker. In 2006, Ernesto Neto, a Brazilian artist, installed "Léviathan Thot", an anthropomorphic installation inspired by the biblical monster. The art installation was in the Panthéon from 15 September 2006 until 31 October for Paris's Autumn Festival. Among those buried in its necropolis are Voltaire, Rousseau, Victor Hugo, Émile Zola, Jean Moulin, Louis Braille, Jean Jaurès and Soufflot, its architect. In 1907 Marcellin Berthelot was buried with his wife Mme Sophie Berthelot. Marie Curie was interred in 1995, the first woman interred on merit. Geneviève de Gaulle-Anthonioz and Germaine Tillion, heroines of the French resistance, were interred in 2015. Simone Veil was interred in 2018, and her husband Antoine Veil was interred alongside her so not to be separated. 1791 Honoré Gabriel Riqueti, Comte de Mirabeau First person honoured with burial in the Panthéon, 4 April 1791. Disinterred on 25 November 1794 and buried in an anonymous grave. His remains are yet to be recovered. 2011 Aimé Césaire Commemorative plaque installed 6 April 2011; Césaire is buried in Martinique. 2015 Germaine Tillion Symbolic interment. The coffin of Germaine Tillion at the Panthéon does not contain her remains but soil from her gravesite, because her family did not want the body itself moved. 2015 Geneviève de Gaulle-Anthonioz Symbolic interment. The coffin of Geneviève de Gaulle-Anthonioz at the Panthéon does not contain her remains but soil from her gravesite, because her family did not want the body itself moved. 2018 Simone Veil Originally buried at Montparnasse Cemetery following her death in 2017. 2018 Antoine Veil Husband of Simone Veil, originally buried at Montparnasse Cemetery following his death in 2013. ^ Oxford English Dictionary, 3rd edition, 2005, s.v. ^ "Patroness of Paris: Rituals of Devotion in Early Modern France". Brills Publishers. 1998. ^ "Foucault's Pendulum: Interesting Thing of the Day". Itotd.com. 2004-11-08. Retrieved 2014-02-21. ^ Jon Lackman (2012-01-20). "The New French Hacker-Artist Underground". Wired. ^ King, Emilie Boyer (2007-11-26). "Undercover restorers fix Paris landmark's clock". Guardian Unlimited. Guardian Media Group. ^ Sage, Adam (2007-09-29). "Underground 'terrorists' with a mission to save city's neglected heritage". The Times. Times Newspapers Ltd.
^ Angelique Chrisafis (1970-01-01). "France president Francois Hollande adds resistance heroines to Panthéon | World news". The Guardian. Retrieved 2015-05-30. ^ Willsher, Kim (2018-06-30). "France pays tribute to Simone Veil with hero's burial in the Panthéon". the Guardian. Retrieved 2018-11-29. ^ France Guide (2011). "Aimé Césaire joins Voltaire and Rousseau at the Panthéon in Paris". French Government Tourist Office. Retrieved 2011-04-09. ^ a b * Roe, David (2017-07-05). "France buries women's rights icon Simone Veil". en.rfi.fr. ^ a b Katz, Brigit. "France's Simone Veil Will Become the Fifth Woman Buried in the Panthéon". Retrieved 7 July 2017. Wikimedia Commons has media related to Panthéon, Paris. The Montagne Sainte-Geneviève is a hill overlooking the left Bank of the Seine in the 5th arrondissement of Paris. Atop the Montagne, are the Panthéon and the Bibliothèque Sainte-Geneviève, used by the students of the University of Paris. The side streets of the Montagne feature bars and restaurants, for example, in the Rue Mouffetard.